Ant-Man and the Wasp director Peyton Reed has opened up about the Fantastic Four movie he never got to make. 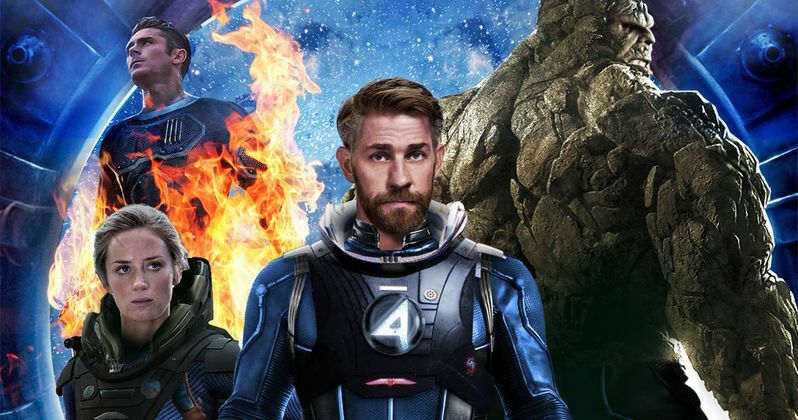 Unfortunately for Marvel fans, Reed Richards and the gang have never had the big screen treatment they truly deserve. That's all likely going to change in the coming years, as Marvel Studios will be regaining the rights to the characters after their purchase of Fox is complete. And, based on what Reed has to say about what he wanted to do with the franchise, they may already have the perfect guy for the eventual reboot. Peyton Reed recently participated in a lengthy Q&A following an IMAX screening of Ant-Man and the Wasp, which he helmed for Marvel Studios. During the course of the conversation, he talked a bit about when he worked on a Fantastic Four movie with Fox before Tim Story would eventually go on to make the first of his two live-action takes on Marvel's first family. Here's what Reed had to say about it. "I actually developed Fantastic Four when it was at Fox, and this would have been about 2002 or 2003. I was doing a movie at Fox at the time and they were gonna do Fantastic Four, and I went in and pitched to Tom Rothman. I developed it for about a year and we went through some different permutations and some different writers, but yes, one of the big ideas was a set-in-the-'60s thing that at the time was structurally gonna be basically like A Hard Day's Night, where we were not going to even deal with the origin story." Not only does Peyton Reed use The Beatles movie A Hard Day's Night as a touchstone which, in itself, is fascinating, but he also makes it clear that they would have possibly made it a period piece and avoided the origin story. That's all intriguing for various reasons. For one, the 60s would have meant revisiting the actual golden era for Marvel Comics. And it seems like the previous movies have suffered from trying to tackle the origin story, while also fitting in everything else to craft a satisfying narrative within two hours. Reed further went on to explain some of what went into their plans that never came to be. Related: Fantastic Four Easter Egg Discovered in Iron Fist, What's It Mean for the MCU? "It was just going to be like you're in Downtown Manhattan and they're there. It was a pretty exciting idea. At the time, again this was 2002 or '03, early on, way pre-MCU, I felt like Fox was not gonna make it. Fantastic Four, for those of you who aren't avid Marvel Comics readers, they are the royal family of the Marvel Comics universe, right? The first family of Marvel. And it felt like they sort of wanted to make a B-movie out of it. So we parted ways." Most recently, we had the Josh Trank Fantastic Four reboot in 2015 which was famously trashed by critics and fans, and wound up being a huge bomb at the box office. Since then, the franchise has remained untouched. However, with the Disney purchase of Fox set to close in the coming months, Kevin Feige and Marvel Studios will be in control of the property and they will surely make good use of the characters. Will the circle back to Peyton Reed's idea of a 60s-set period movie with no origin story? Maybe. Maybe not. But it wouldn't be surprising to learn that Reed is the guy who winds up directing the reboot, given how well he's done on his pair of Ant-Man movies. For more with Reed, feel free to head on over to Collider for the full 80-minute Q&A.